In 2008, the Ruler of Dubai Sheikh Mohammed bin Rashid Al Maktoum, endorsed the design of Ferry Dubai, costing Dh178 million. The plan for Ferry Dubai was to reduce traffic congestion on the roads. The obvious use of the waters around Dubai is being exploited to help reduce road traffic, which is becoming more congested every day. The 32 meter long 20 ton ferries are dual base Catamaran Low Wash vessels, with a passenger capacity of 100, Comprising of 84 economy class, 14 business class and 2 seats for people with special needs. This will initially start off as a fleet of two, increasing later up to ten, as the demand exceeds for more ferries. The ferry service operated by Dubai’s Roads and Transport Authority (RTA), sails in the Dubai Creek and links Jumeirah Beach, Dubai Marina and the major waterfront developments. The initial service will be a tourist route. Eventually the ferry service will operate between four custom designed stations strategically located along the creek: The Gold Souk, Union Square, City Centre and Al Ghubaiba. Once full service is in operation the ferry service will provide a link with the Dubai Maritime City, the emirate of Sharjah, The Palm islands, The World and The Waterfront. The ferries are capable of 24 knots an hour which will ensure that they are on time and never run late, Estimates suggest that the ferries will transport around 3 million passengers during the first year. Fitted on all of the ferries are the latest in entertainment to amuse the passengers for the hour journey, as well as having the necessary safety equipment in case of an emergency, with the ferry fleet all complying with all international and safety requirements. Each ferry is fitted with four LCD and DVD monitors, three toilets and a kiosk for selling gift items and snacks. Having noted the entertainment onboard we don’t think you will need it as theres plenty to see on route and if the waters calm you can go outside for even better views of the Dubai coastline. This is a great way to get from the creek to the marina and a great deal of fun to boot. The Dubai Ferry currently runs from five ferry terminals: Dubai Marina, Al Ghubaiba, Dubai Canal Station, Al Jadaf and Sheikh Zayed Road Station. The first two stations to operate were at Al Ghubaiba and Dubai Marina, with a terminal at Al Mamzar introduced in October 2014 – However, Al Mamzar no longer runs services due to lack of demand. Ferry services run 7 days a week. From November 2016 ferry services started using the Dubai Canal, trip details are shown further below. 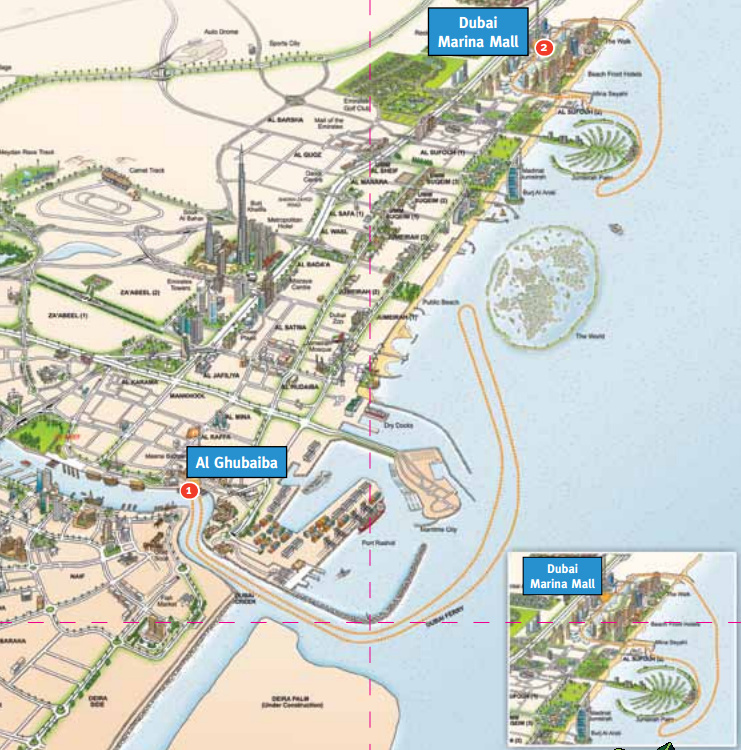 The Al Ghubaiba terminal is a minutes walk from the Al Ghubaiba Metro station, near the creek abra stations. The Marina terminal is a short walk (about 500 yards to the left) from outside the Marina Mall. There are circular tourist type trips that run for approximately 1 hour from each terminal but there are now also trips that run from one terminal to the other (which also take 60-90 minutes). 11am, 1pm and 6.30pm One way trips from Al Ghubaiba to Dubai Marina and Dubai Marina to Al Ghubabiba. From November 2016 these trips will stop at the Dubai Canal Station en route. 12pm (midday) and 5.30pm One way trips between Al Jaddaf Station and the Dubai Canal Station: calling at Dubai Design District, Al Wajeha Al Maeyah, and Marasi stations in the Business Bay; and the Sheikh Zayed Road Station in the Dubai Water Canal. (Thursday and Friday) Tourist trip from Al Mamzar (circular) Not currently running although you can book a circular trip if you give 48 hours notice. Scheduled circular services (services that start and leave from the same station) will only run with at least 10 passengers. You can also privately hire the boats for your own trip at any available time between 9am and 9pm. Evening trips are busier so you may need to get to the terminal well in advance of the sailing (30 minutes or more). Both circular routes run along the shore from the terminus with views of the coastline and the many local attractions, they run for one hour and then return from the place they started from. In this way they are really just excursions rather than a means to actually get anywhere within Dubai. 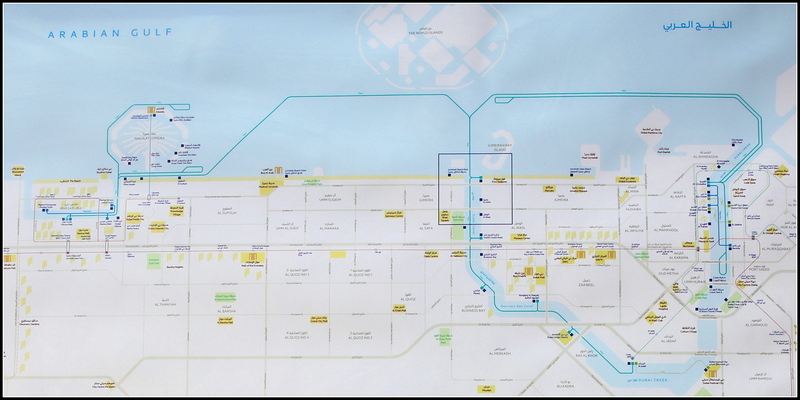 Here is a summary map of the routes that are covered by the Dubai Ferry. You can click on the map to see a larger version. There is also a route running from Dubai Marina and out to the Burj al Arab for 60-90 minutes at 3pm. In addition you can travel at 11am, 1pm and 6.30pm from Dubai Marina to Al Ghubaiba. This stops at Dubai Canal Station en route. 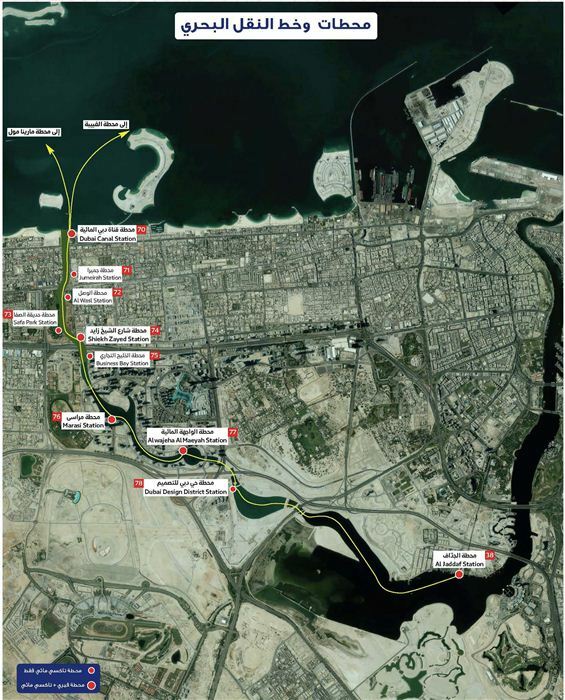 The route covered by the Al Ghubaiba ferry for the circular trip at 5pm is shown below. However, note that the route may be subject to change. The 3pm trip stays within Dubai Creek. In addition there is a ferry running from Al Ghubaiba to Dubai Marina Ferry terminal at 11am, 1pm and 6.30pm. This stops at Dubai Canal Station en route. From November 2016 a new route was added in the Dubai Water Canal that goes from Al Jadaf to Dubai Canal Station and back at 10am, Midday and 5.30pm. The Dubai Ferry can be hired for private trips with no seats so that guests can mingle. It costs 2800 dirhams per hour (prices may change). You can also use the Water Taxi and the Water Bus for your journeys. Information Courtesy of the RTA.